Homemade flannel slippers, what could be cozier? After all, The Season of Cozy is upon us. Let’s learn how to make fabric slippers! I wear my DIY fabric slippers daily. These are non-slip slippers and they have a super comfy minky lining. I’ll tell you all about how to make them non-slip and how to make a sole, along with a free pattern, so you too can get cozy. And I had fun making the Rolled Fabric Flowers we posted last week as little embellishments. Gorg, right? 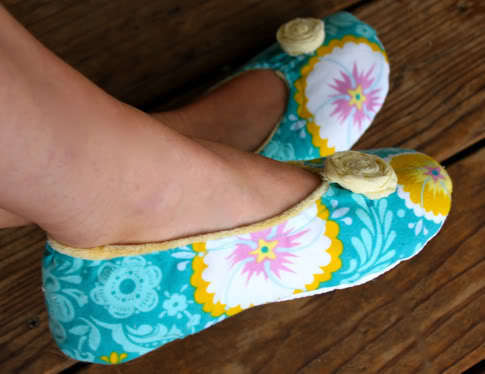 Get the full How to Make Fabric Slippers Tutorial and Free Slipper Pattern below.. So you’ll need a few things to get started. You’ll need some fabric for the outside and the lining. I used pretty Anna Maria Horner Folksy Flannel Fortune in Marine, and this AMAZINGLY luxurious Minky – Moda Snuggles Whimsy in Butter (seriously the nicest minkee i have ever touched) as the lining. I think they look pretty cute together, right? You’ll also need some 1/4″ elastic, less then a yard (for size 9 feet you’ll need 22 inches -2 pieces each 11″ long- to be exact). Now, you can skip an insole but your slippers won’t be very comfy, so what’s the point in that. So buy a pair of these in your size: washable insoles. And then to have a nice non-slip bottom pick up some of this (you can make about 3 pairs with this $3 package): Jiffy Grip. 1. So download the free slipper pattern and print it out here: Pretty Prudent Slipper Pattern. It’s for my feet which are a massive size 9. So to edit it, you can make them shorter by cutting a bit out of the middle of the sole. If you cut out an inch, then also cut out an inch on the length of the side piece. I hope that makes sense. But at the end of the day, these are slippers and they have an elastic top, so they are very flexible when it comes to sizing. You can also use a slipper or shoe that fits you to create your own pattern, using ours as a guideline. So get the Free Pretty Prudent Slipper Pattern here. We need to sew a channel around the top for our elastic. Push your shoe back into place. Now make some rolled fabric flowers or pom poms or what-have-you for decoration (or none, whatever your pleasure) and sew them on. Finished and it feels so good! So you’ve learned how to make fabric slippers. How do they feel? Oh wait, I forgot to mention you have to start all over and make a second shoe. That’s the thing with shoes. And pillows. And earrings. So anyway, now that you know how to make fabric slippers, making another one will be easy. So do that. OK, now you’re done. I can’t wait to make a tiny matching pair for Scarlet! Think you’ll decide to learn how to make fabric slippers? I’ve loved seeing all the pictures of your creations, I can’t wait to see more! Share them with us on our Facebook community or in the comments. Follow us on Pinterest for more DIY tutorials! Perfect gift for a baby shower! I need to make some for my vacation, I mean, my days in hospital. So pretty & love the roses! FINALLY someone in blogland with big feet!! Adorable! I am going to steal your idea and make tiny slippers for my little girl. So cute! Is that jiffy grip washable? These are super cute! My Mamaw loves her slippers these would be awesome for her. Plus if she knew I made them that would make it even better for her!! =) I actually just bought some elastic last night so I just need a couple of other things and I can do this!! After having my twins my feet were a size 9. Yikes! Finally an advantage to these "massive" feet-I don't have to resize this wonderful pattern! I'd love it if you'd post the pattern for Scarlet's when you make them. I'd like to make some for my girl, too. If your size 9s are massive, what would you call my size 11s? The flowers on each slipper look great. BTW My father told me that larger feet are a blessing because they gave me a solid base so I wouldn't be blown away in a heavy wind! I live in the state of hurricanes. ok now i am super self conscious about my giant feet. and yes, emily, jiffy grip is washable. it's awesome! great for making jammies and gardening gloves too! Um, Size 9 is NOT MASSIVE! Be nice to Jaime and her clown feet. FYI, I'm a size 10. So cute! I've been making my baby girl little felt shoes much the same way, but my sewing machine is broken so I've been hand sewing. To make them non-slip, I draw with puffy paint on the bottom. I have tried the puffy paint thing, but it doesn’t work for a no slip grip on my daughters shoes. do you have to sand the puffy paint after it dries? i love these, and i can't wait to make a pair of ostentatious ones for my mom this christmas! Those look great. I may have to make some for Christmas for my daughter. Yeah!!! Thank You so much for this tutorial! I want to make some pairs for my daugther to use at the day care. Here in Finland we don't use shoes inside the places, but the day care is cold and wearing just the socks is not enough… I think those slippers would be perfect for she use there. Love these slippers! and its a great tutorial too! Very easy to follow..makes me want to go right out and get some fuzzy fabric and make a pair right now. Thanks so much for sharing! brilliant tutorial! These are great!!! These are awesome! I have been wanting to make some slippers for my daughter. I have a question though, her feet are very tiny so I don't think I can buy insoles for her. Could I just use extra layers of batting? What type and how many layers of batting would you recommend? i love how they're ever so slightly retro feeling…but entirely adorable. can't wait to *try* to make them! they're perfect for a craft swap my friends and i have coming up! SO CUTE! And I'm extra super excited because I have massive size 9 feet like you, too. The better stability, my dear, right? Best ever tutorial for homemade slippers! I never comment anything, but this time I`am making exception. I love it! but how do you change the size, esp to a childs foot? loooove this and plan on doing these and the eye masks for all the ladies in my family for their b-days this next year. one question – where did you find the slipper insoles? I finally made a pair 🙂 …size 9 is too small for me so off to my cousin they will go! Now to figure out how to send you a picture! Hi, Thank you for this wonderful tutorial. This is my version. Hi there, hoping you can answer my question. Am working on a pair of these right now and, I may be missing something, but I don't see that you've mentioned what size seam allowance is built into this pattern anywhere. It looks like 1/4 inch? Love these. I've made two pairs already. It was quick and they are great for using left over fabric!! Holy snaps your tutorial is amazing! I’ve been fretting about how to get cloth shoes for a project since I can’t seem to find them online. Super good instruction and pictures. Cute and so easy to do it! I had to make for my grandkids,along with the pijamas botton… they liked…thanks for the instrutions/pictures, all well done. I’m from Brazil and here these slippers are gifts for weddings, for women guests and bridesmaids, when they dance and are exausted, they put off their shoes and put slippers for dance more and more, they are made of silver or gold tissue and curling around itself and in a cute little bag for gift. The link to the pattern isn’t working. I have given your templates to my class of 10 year olds and they have been having an amazing time creating slippers! Thank you!!! These look so cute and easy! I’m very new a sewing so I have a simple question: How much material did you buy for this project?? One yard, etc? I’d hate to guess and be very wrong. Thanks! Now is the season for making the slippers since it will soon be getting cold. Thanks!! I absolutely love this tutorial! Thank you so much! I was so excited to make these slippers, but no matter what I do or how hard I try I cannot bring up the actual pattern. I keep going through the tutorial to see if I am missing something, but the same page keeps coming up. Please help me. I would love to make these slippers. Make sure you scroll down. The link is under the picture of the jiffy grip. I had the same problem. Just made these for a Christmas present but the pattern is a little off, at least the way I did it so I would recommend you make it about half a size larger than you think you need it so you will save a lot of trouble like I did!! Just made these for a Christmas present but the pattern is a little off, at least the way I did it so I would recommend you make it about half a size larger than you think you need it so you will save a lot of trouble like I did!! They did come out adorable in the end! I can not wait to make these for myself. I use to have a pair that I loved, but they wore-out and I have not been able to find in my size 10. found this on pinterest. Thank you for the great step-by-step. The tutorial for this project made these slippers a joy to make. I commend the teaching skills of the designer. Many people claim to offer easy instruction, but skip or eliminate steps that can often confuse the most experienced seamtress. I am a beginner sewer and I appreciate the time and consideration taken by a good teacher. I made these slippers in an evening and wore them the same night. When I showed my 78 year old dad my finished product, he smiled like a proud papa. Plan to make them as gifts for friends, family, and charity. thank you so much! what a wonderful comment to read. i am glad your slippers turned out so well and your feet are cozy! Absolutely brilliant! Not only that, but they pretty, cozy, sooo “YES”!!! Very cute but seem very expensive to make. The link for the Jiffy Grip is $58! Think I will just buy slippers. I used this link to buy jiffy grip for $5.00. http://www.amazon.com/Jiffy-Grip-Stop-fabric-pajama/dp/B009WHFAWK/ref=pd_sim_ac_6 This is much cheaper. I think the link she posted was incorrect. I’m very happy to uncover this website. I need to to thank you for ones time for this wonderful read!! I definitely appreciated every little bit of it and I have you saved to fav to look at new stuff on your website. Even when Inez and Vinoodh’s symbolism runs that stylistic gamut through high fascination to some portraiture and conceptual tableaux, found at its Isabel Marant boots cardiovascular is a special and Isabel Marant boots sale highly recognizable lexicon in playful present and intensive gesture. Invented largely in collaboration with the choreographer Stephen Galloway, it is this language that will consistently carries their snapshots from pure sartorial studies inside something transcendent and strange. Hi, I do think this is an excellent website. I stumbledupon it 😉 I am going to revisit once again since I book-marked it. Money and freedom is the best way to change, may you be rich and continue to help others. acres, it’s better to specialize in just a few varieties to not become overwhelmed. The link you have to the $3 package of Jiffy Grip goes to a Jiffy Grip product on Amazon.com that costs $50 for an 11″x24″ board. Can you post the actual name of the product that you used? Thanks! forget that stuff. Cut the sole out in felt or Denham or fleese and then get a roll of the rubber cabinet liner from the dollar store and baste that over it. Nice and grippy and cheap as hell. I am having trouble getting the regular pattern to come up to download/print it. The baby slippers downloaded fine but the link to your regular pattern does not. Please email me a correct link or the pattern if you could please! I would love to make some. Yours turned out really cute! Am Amudha from India. I would like to make this slipper but I couldn’t get this materials , can u guide me. If u get contact me its my great opportunity. Hey there, Nice write-up. There exists a issue along with your site within website internet explorer, may test that? Firefox on the other hand is the market place innovator in addition to a substantial part of folks will miss out on your fantastic composing for that reason dilemma. Love your detailed instructions. However, I don’t see where to get the “pattern” for these adorable slippers. Would your, please, reply to my email address. I printed out your pattern and then just minimized the copy and made a smaller pattern. Thank You for sharing this awesome pattern!!!! So glad you liked it! I’d love to see a picture of your slippers! This is best tutorial on making a pair on slippers, that I have researched. I am interested in making a pair of slippers for gifts for my grandchildren. I brought a book on making slippers. Not as detailed in their instructions, as yours. Thank you for sharing! There is not other words to tell you that … THANK YOU VERY MUCH! GREAT TUTORIAL, will be very useful for me! Just gorgeous – looks like another project to try. We are now in Autumn (or should be – its still hot in Australia) but it will be lovely to make a pair customised to my mum’s small foot. So glad I found this website. Thanks again. Love the pattern and plan on making several pair! directions sound very easy to follow! Heya! I’m at workk surfing аround your blog from my new iphone! yyour posts! Caarry οn thе excellent աork! Thank you for the tutorial, I just made the slippers. I used white minky on the inside and penguins in winter on pink as the outside. I decided to skip the elastic, becase I live in Florida and it gets pretty hot here. Helps to let my feet breath. Again, thanks. It was super easy to follow your pictures and instructions. They are so darling and i will mahe a pair. Btw i am a size 9. Good job. Thank you so much for this tutorial! Seeking it for such a long time! it’s a great gift for me! Great tutorial for a comfy pair of bedroom shoes! Must try this soon! Mine turned out very small (about a size 6) but I’ll definitely be trying again thanks to the helpful re-sizing tips! Thank you for this tutorial! I’ve been trying to find a good one for ages! The search is over. The pattern page is missing? If someone has the pattern would you be so kind to e mail to me please. I would so appreciate your kindness. My mail is ssheidy@msn.com thank you again. A question: Is the seam allowance included in the pattern pieces, or does it need to be added. If it is included, what is the seam allowance? Lastly, thank you for making this pattern available. The slippers are so-o-o cute! To anyone having a problem with the size, you have to unclick the “fit to page” option before printing. The pattern will actually run off the page a little. Your printer most likely fits it to page automatically. exactly what i was looking for….getting material today…can’t wait to get started.. Thank you very much for this little tutorial so friendly. The explanations are clear, it’s very nice to share. These booties, I love them! You want to see some pictures? Et encore une nouvelle paire! I just made these and love them! I think I am going to make an extra pair (or 6 🙂 ) to toss in my car for the drive home from work after a long shift on my feet all day at the hospital! The only part that I stumbled on a little bit was the seam allowance for the heel on the upper and lining. I found that 1/2″ worked best to match the size of the upper to same size as the lower. Omigosh !! I have a couple pairs of fabric slippers I bought two years ago and they are my favorites, but since they are becoming worn I have wanted to replace them with my own fabric creations. You have made my plan SO EASY with your fabulous pattern !!! Now I can make as many as I want – great for stocking stuffer gifts at Christmas too. Thank you so much !!! Thanks so much for the pattern! I had to tweak the pattern a little for my size, but they turned out great. The pictures helped a lot! this is great. I am sure the fabric exchange has so many choices of fabric for this kind of project. Where is the free pattern download? I’ve been through this page 10 times and all I get to download are pdf converter, or some other program that I don’t need. Love to have this pattern if I could get it. Same problem as Kathy, when i click on where to get this pattern – i go in a silly circle of ending up on the same page, again, and again , and again . . . . . . .
What is the seam allowance? And is the seam allowance in the pattern or do you have to add it? I used a 3/8 ” seam allowance and cut the pieces exactly and ended up with a size 7?? Thank you so much for this amazing pattern. I no long will need to buy slippers.